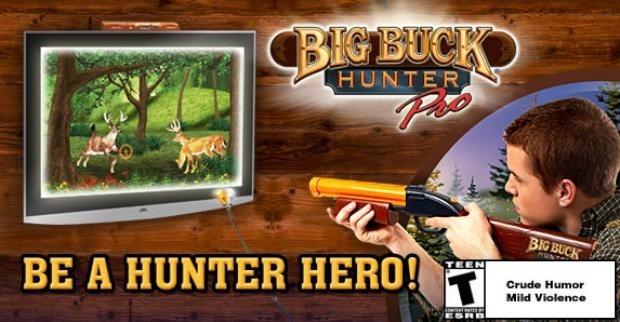 Short Version: A faithful recreation of the arcade classic, Jakks Pacific’s Big Buck Hunter Pro TV Video Game is a nice alternative when you’re too lazy, broke, or inebriated to make it out to your local watering hole to play the real thing. Ah, sweet memories of being in my early twenties. My friends and I would have just had our asses handed to us twice in the double-header softball league we somehow thought we’d be able to conquer year after year, our postgame analysis short-lived at the dive-bar-turned-cougar-hangout called Bunny’s on Excelsior Boulevard in the Minneapolis suburb I called home for years and years. All of it was simply a warm up to the marathon session of Big Buck Hunter that’d inevitably take place until closing time week in and week out. Now I’m 30 and living in Boston. A dull heartache comes and goes in early May of every year as my Minneapolis friends work out their attack positions and flanking maneuvers for the upcoming softball season (if anyone in a semi-serious Boston softball league needs a first baseman or outfielder, please let me know). Most of my friends have kids now and last I heard, Big Buck Hunter’s been replaced by a quick beer or two from a cooler after the game interspersed with discussions about mortgage rates and paid time off. But I digress. You probably want to hear about this game now. It’s good. Well worth the $40, in my opinion. I’ll admit that I haven’t played the very latest arcade versions of Big Buck Hunter, but this play-at-home game feels pretty close to the original arcade version as well as Big Buck Hunter II. The gun controller is a little bit on the cheap side but feels like it ought to be able to withstand some manhandling. My main gripe with it is that the barrel’s pretty short, which makes the pump action of the fore-end somewhat unsatisfying. Other than that, though, it’s a decent – not as nice as the arcade version but, hey, this thing costs $40. The on-screen aiming cursor is the main weak point of the entire package. Its slow reaction time makes your main objective – trying to shoot moving animals – a bit frustrating. I eventually overcame this by training myself to ignore the cursor and use the sight on the gun barrel. Even though the cursor’s slow to react, the game will indeed register where the gun’s aimed when fired, not where the cursor happens to be located. Those minor gripes aside, this Big Buck Hunter fan has been a happy camper. For roughly the same amount of money that you’d spend playing the arcade version for a few hours, the home version provides a similar enough experience to make the purchase worthwhile.